Watersports of many different kinds are popular at the various resorts in the Maldives, including parasailing, surfing, windsurfing, sailing, waterskiing, kite surfing, and tubing. Visitors also love to go cruising in glass-bottomed boats, often in search of dolphins to swim with. Parasailing in the Maldives is a great way to explore the scenic splendour of the islands and the vistas of coral and water beyond from a bird's eye view. Only the larger resorts offer it as an activity and those that do usually have courses for beginners. If your resort doesn't offer parasailing it is usually possible to arrange a visit to a nearby resort that does. Two resorts well-known for their parasailing are Fihalhohi and Adaaran Hudhuran Fushi. The lagoons found around most of the islands make the conditions perfect for windsurfing in the Maldives. 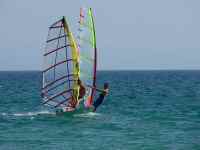 Most of the resorts have windsurf schools or watersports centres offering lessons and equipment hiring facilities. Boards and sails for hire cater to varying skill levels so it is important to ask advice. Most resorts in the Maldives offer windsurfing as an activity, but some of the most well-known islands for enjoying the sport are Rihiveli, Velassaru, Baros, Meedhupparu, Anantara Dhiggu, Medhufushi and Kuramathi.